Good morning! I was recently browsing one of the scrapbook magazines and came across an article on making simple, easily mass-produced cards for Christmas. One in particular stuck out in my mind. They had used a photo as the center image and made it look like a big postage stamp. I wanted to do something similar, and the timing coincided with Kristin's challenge, JUGS5, which is to create a holiday card showcasing a photo. I also combined this with the CPS140 sketch. I used a few layers on my card, added some stitching and mounted my photo with foam tape, but otherwise I kept the card fairly simple. I used a recent favorite photo of Sabrina, which I first cropped to wallet size in Photoshop, then I converted it to black and white and added the year. Next, I created a blank 4x6 document and dragged the photo onto it twice so that I could print 2 photos on a 4x6 sheet of photo paper. I think I may end up making a few more of these with her Christmas photo. Accessories: Circle and Scalloped Circle Nestabilities (Spellbinders), Postage stamp border punch (EK Success), Foam tape, Thread, Sewing machine. Fantastic card!!! Love the layout :) Great take on the challenge. Wow Stephanie! Your card is GORGEOUS as is the pic of Sabrina! What an awesome way to showcase her photo. I love all the stitching! Thank you for playing along with Just Us Girls! I hope you join us Saturday for a fun sketch challenge! 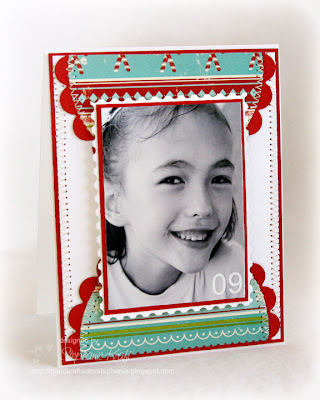 OMGosh Stephanie this is PERFECT for our challenge - I LOVE that it looks like a STAMP! although when was the last time we saw 9¢ postage?!? LOL Great stitching and lovely layout. Thanks SO MUCH for playing along with Just Us Girls. Enjoy your fabulous digital image set! Hope to see you again on Saturday for a super fun sketch challenge! Such a darling card! What a great way to incorporate a picture! Great card! Love all the details! Please be sure to email JUGS if you would like to receive the free digis! I would love to share them with you! This is wonderful! Love the clean fresh colors you've used--very creative!